Do you remember your excitement when tabbed web browsing was introduced? I do. Without the laborious faff of opening up a whole new instance of Firefox or Internet Explorer, browsing the web became almost frictionless. It seems obvious now, but back in 2002 it was revolutionary. You could middle click on any link and it would open silently in the background while you continued to read the page you were on. A miracle! My desktop instantly became less cluttered, with twenty tabs open in just one programme. And I could leave those tabs open for days at a time, until I worked my way through them (or more likely shifted them to a bookmarked folder). For fifteen years, I rinsed this delightful innovation, using it to rattle through thousands of web pages every week. I never dreamt that there could be a better way – far less that this better way would be to return to the untabbed browser style that was buried with AOL and Netscape. My change began with a realisation: try as I might, I can’t read everything on the internet. It slowly dawned on me that this Herculean – nay, Sisyphian task meant that I wasn’t giving the articles I do want to read the attention they deserve. I was skimming and flitting. This (I speculated) was having a negative impact on my retention of information. I had a sense that I was aimlessly browsing to certain websites, particularly the BBC, when I had any brain down-time. I doubted this was doing the job of settling or recharging my brain and was thus foolish. Wouldn’t I be better off going for a walk or having a lie down? Even the things that the internet does well, like quickly answering specific queries, I was not doing efficiently. Rather than dashing off another tabbed web search the second I have a question, a more effective method would be to write down whatever I want to know and batch these activities into one searching session. I would, from now on, go back to opening a new instance of my browser every time I wanted to read something new. On my ageing computer, this takes all of three seconds and irritatingly opens in front of whatever I’m reading, not at all like the silent (but deadly) background load of a new tab. So what happened? Am I using my computer time more efficiently? How has my browsing changed? Am I still trying to read the whole Internet? Luckily, I am an enthusiastic gatherer of statistics. I’m away in Wales at the moment and my bedtime reading is a book called Statistics for People Who (Think They) Hate Statistics. So here’s my analysis. In the nine weeks since I instituted No Tabbed Browsing, I have used my computer 1 hour and 8 minutes less per day compared to my average throughout the rest of 2016. That’s more than 7 hours less every week. Even if I remove two weeks that could be outliers – Christmas and New Year – I’m still using the computer 45 minutes less per day. That’s 45 minutes I can use to go running, cook food, talk to friends or just spend in bed. Perhaps more pertinent, though, is a measurement of efficient computer use. Using a free monitoring programme called RescueTime, I’m able to track what programmes and websites I use throughout the week. RescueTime then calculates a percentage score for productivity, based on my assessments of whether a particular programme or website is productive or distracting. BBC News, for example, is ranked as Very Distracting, whereas OpenOffice Writer is Very Productive. It’s not a flawless system, but over a period of months, I reckon it balances out. The results here are more interesting. Productivity in the 9 weeks since No Tabbed Browsing has increased to 64%, from an average for the rest of 2016 of 57%. That’s a huge increase – imagine you could squeeze an extra 7% out of your working day without any increase in hours. However, it does also appear that I was indeed spending less total productive hours in front of the computer. My average daily productive computer time before the experiment was 2:42. In the 9 weeks of No Tabbed Browsing, this fell to 2:14 (or 2:26 if I exclude the holiday period). That’s 16-28 minutes less working time per day – suddenly the water is muddied. From these two calculations – productivity score and total computer time – I can see that I spent just over two hours a day dossing around on my computer in the year before No Tabbed Browsing. Since then, time-wasting has dropped to only just over an hour and a quarter. Given the glories of the world beyond my screen, this significant fall can only be a good thing. But where was that wasted time going? There’s not much distracting content on my computer – I don’t have any games and I rarely sit down to watch a film. My only regular source of distraction is the internet. Unfortunately, accurate historical internet use statistics are hard to gather from the browser I use, Firefox. However, I did take a measurement in the week before I started No Tabbed Browsing. In the week beginning the 12 December 2016, I visited 2188 unique web pages. Websites I visited multiple times, such as the BBC home page, are only counted once in this figure. That’s a bewildering 312 pages a day, or (allowing for sleep) 20 pages every hour – a different web page every 3 minutes for a whole week. In contrast, during the first week of my experiment, I visited just 342 web pages. That’s still 49 pages a day, but a much more manageable number considering my prior affliction. If I run the numbers based on per hour of computer time, in the week before No Tabbed Browsing, I visited 49 web pages per hour. In the week after, that fell to 26 web pages per hour. This lower trend continued for a month after the start of the experiment, but I have since seen a return to numbers in the 40-45 pages per hour range. One week at the end of January, I somehow managed just over 70 web pages per hour of computer time! Frantic. With my reduced computer time, however, absolute numbers of web pages is still about half what I managed in the week before No Tabbed Browsing. There’s another interesting angle on how my internet use may have changed thanks to No Tabbed Browsing. Because Firefox only records the last time I visited a particular web page, I can estimate what percentage of my web use is trawling for distraction rather than visiting a specific page I want to read. In that last week of tabbed browsing, 70% of the pages I visited were ones I haven’t visited since. In the first week of January, 88% of the pages I visited remain unique. Although not secure, the results are suggestive. I’m landing less often on distraction gateways like the home pages of the BBC, Guardian or Reddit, and more often on pages that I find through search or recommendation. 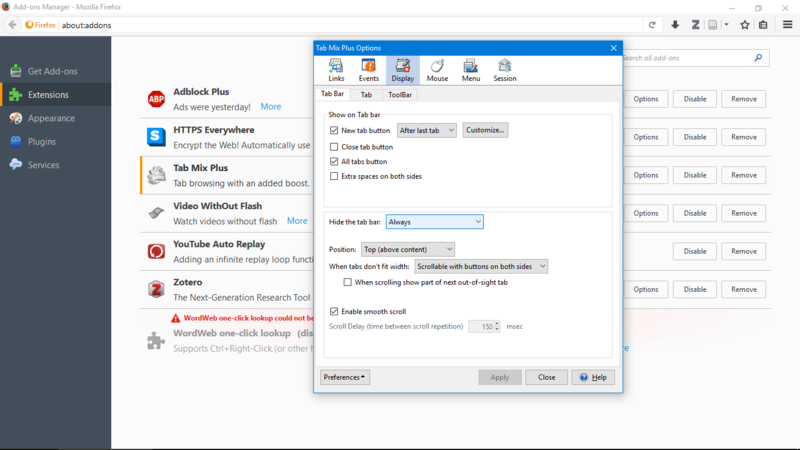 I sincerely believe that No Tabbed Browsing has made internet trawling more difficult and this has made my computer use in general more mindful. After nine weeks, total computer hours remain lower than before. My internet use, although now back at similar levels per computer hour as before the experiment, is more likely to be what I define as productive. This is reflected in the persistent 7% increase in productivity reported by RescueTime. A good case study for how my internet use has changed through No Tabbed Browsing is the BBC – my all time favourite site for news, sport, analysis and boredom-relief. In the nine weeks since starting this experiment, I have visited 292 BBC web pages, about 32 pages every week. In the nine weeks immediately before the experiment, however, the parallel figure was 762. That’s 85 different pages every week for two months. If you’re wondering, yes that figure does hold up. Over the course of 2016, I read an average of 81 unique BBC pages every week. Now I love the BBC, but how much news does one man need? In 2013 I experimented RescueTime to let me knew how much facebook I was doing and surprisingly it was only 16 minutes per day, but what was more interesting was how many hours I did spend on different programs in my work-computer. I thought I was an Industrial Designer and for that reason I would spend most of my time on AutoCad or 3DStudio, but no, RescueTime showed me I was 60% of my time on Outlook! Those figures showed me how an Industrial Designer is more an e-mail replier than a draftsman! Ha! It is very interesting. What would also be interesting is how those 16 minutes of Facebook time were distributed throughout the day. My main beef with Facebook isn’t that it takes up loads of time, but that it is highly distracting. 16 minutes in one block is fine (if we ignore for a moment the psychological impact of being a member of Facebook in the first place), but 16 minutes divided into 32 micro-checks of 30 seconds each – that’s what does the damage. This was certainly my experience of Facebook use: I’d just have a flick through every now and again (mostly now AND again!). Thank goodness my #1 activity is writing – but I know I’m very lucky! FULL DISCLOSURE: I originally wrote “I spend most of my time writing…” – but this isn’t true! 38% of my time is spent writing. I spend almost as much time faffing around with file management, email and online research. Oh the life of a writer! Previous Previous post: We Meat Again!